The 1/8th scale off road Championship took a trip North to Derry last weekend for round 4 of the series. 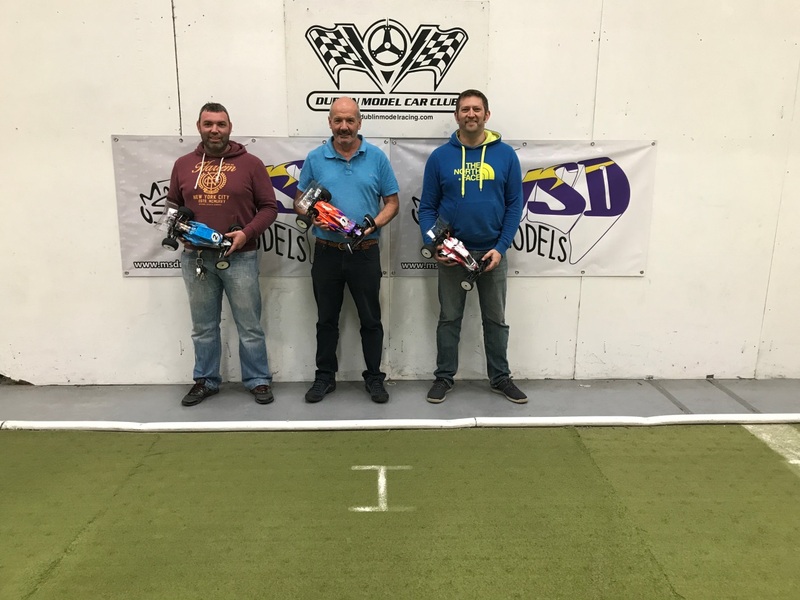 This was the Derry clubs first time to host the National series and the drivers were treated to a well prepare track and venue for the weekend. 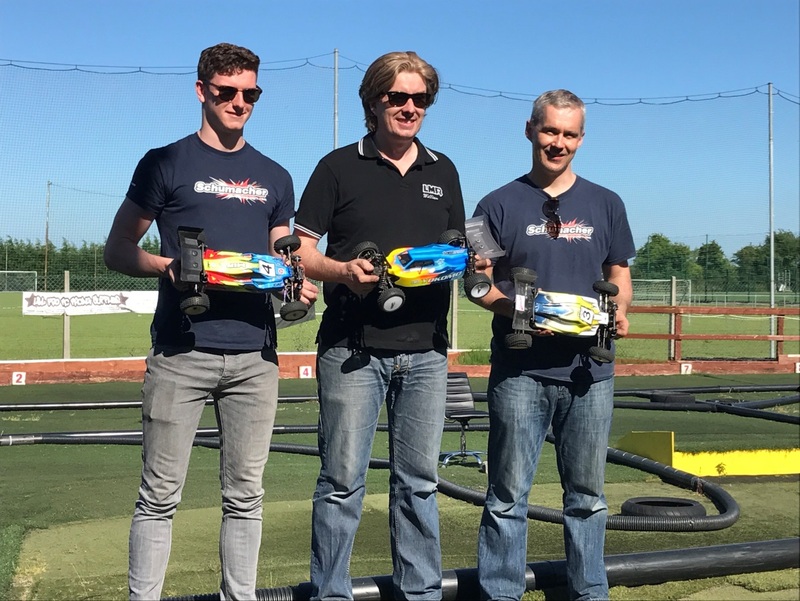 The layout was a change from the larger open track giving drivers a taste of a tight technical track which lead to close racing in both nitro and ebuggy. The weather was ideal and the atmosphere among the racers was high. Drivers where improving quickly with each round of practice and qualifying as they fine-tuned setups and confirmed the best tire choice for the conditions. Race control manned by David and Gary kept watch over the track and the drivers making sure the event was running on time. By the finals on Sunday, the track had developed a little more character and a racing line had developed on track. In Ebuggy Bradley Baird (TLR) took T.Q. out qualifying Barkley Abernethy (Agama) in the E Buggy Class. Bradley however didn’t have it all his own way in the Final; an early mistake dropped him behind Barkley and he had to work to recover the lead pressurizing Barkley for a few laps before a slight wobble from Barkley left enough of a gap for him to charge through to regain top spot which he maintained till the checker flag. 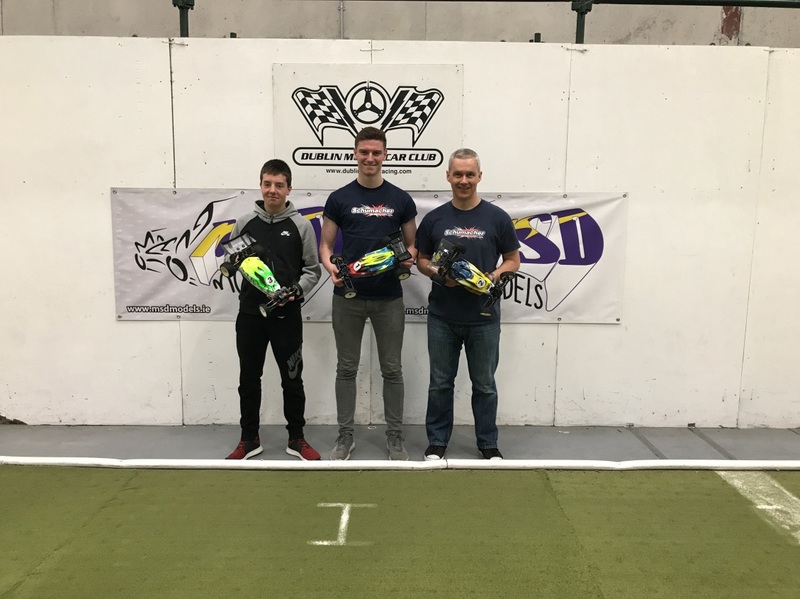 Rounding of the podium in third place was a delighted Martin Jacques (Kyosho) who took his first National Podium place all while celebrating his 21st again this weekend? Congratulations Martin. In the lower Nitro finals we had a number of great performances, current junior championship leader James Gilliland (Tekno) took top spot in the C Final with a dominating driver to win by 2 laps at the flag, with newcomer to the championship Jason McCauley (Kyosho) taking a strong second place and a bump up into the B Final after starting from sixth on the grid. 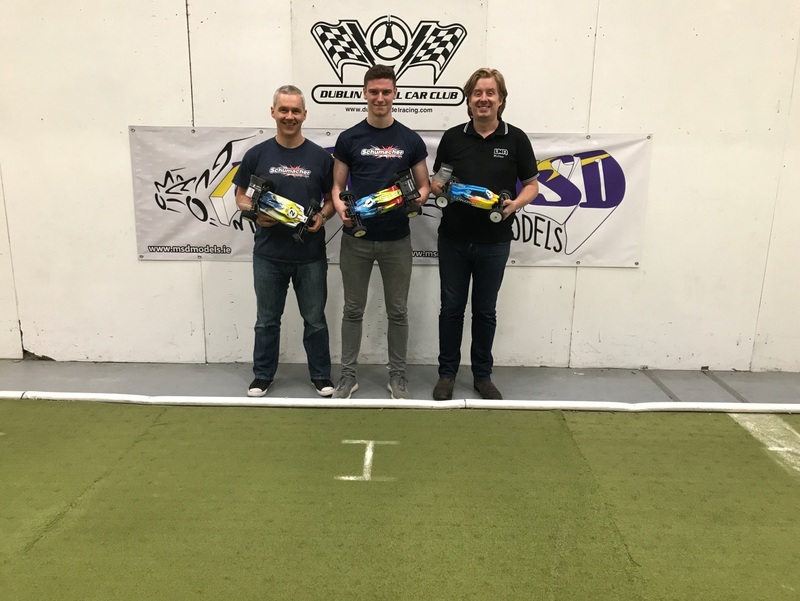 In The A Final Bradley Baird took pole position in the Nitro class (TLR) and came in first position in the A Nitro final but again it was a narrower margin than we are used to seeing from him at the Nationals. Andrew Mc Clean (Agama) who has been in great form this season started fourth made up places throughout the race jumping up to second. 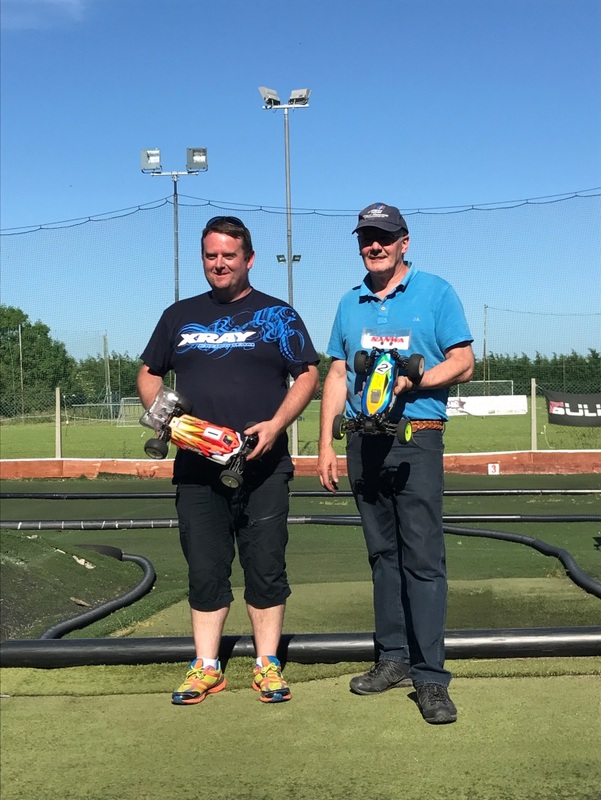 He maintained a level head under extreme pressure from a charging Alan Scroogie (Kyosho) taking second place after 45mins by just a second in a dash for the line. Well done to all the drivers who took part over the weekend. On a Final note, a huge shout out to David Carr, Gary McDevitt and all the team at the Maiden City Club for all their hard work at getting the venue ready and for running a great event this weekend. Next up is the Final Round of the Championship, Round 5 will be in Navan on the 9th & 10th of September. 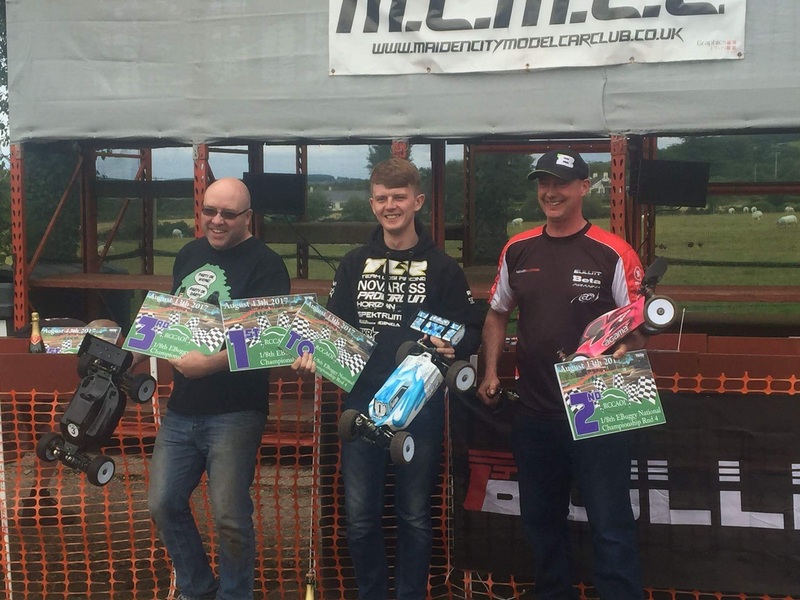 Round 3 of the RCCAOI 1/10 Off Road National Championships took place at DMCC on August 6th. Luckily we were racing indoors as the weather wasn’t exactly perfect!! DMCC had recently re-worked the layout and put on a demanding track for the day. The jumps required some timing to get right and there was definitely a fast line around some of the more open sections. Some close racing was expected her with Ivan and Gary in the same heat. Round 1 didn’t disappoint with Ivan edging out Gary by 0.8s. Round 2 was more of the same with several lead changes before Ivan eventually took the win and overall TQ. Round 3 was another good race with Ivan finding a rhythm and moving into 16 laps to stamp his authority in the heats! As in 2wd, Dylan went extremely fast in heat 1, with an 18 305 and an average lap of 16.9s. Denzell was 2nd but almost a lap down so the rest of the field had a bit of work to do! Round 2 saw both William and Denzell improve to within 5s of Dylan so it was getting closer. Dylan did enough to take the overall TQ. Round 3 saw Will improve further and took an 18 lapper and secured 3rd overall in qualifying. Dylan won the final round with another 18 305, confirming has fast pace! 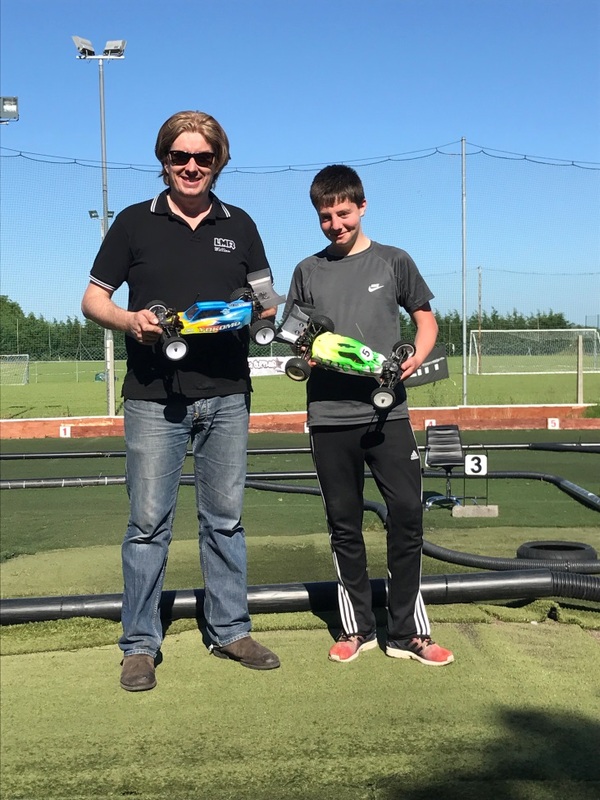 With some of the usual suspects on holidays Ivan was the sole competitor and took TQ! Dylan led from the start tone to take leg1. Alan got past Denzell on Lap 3 and chased Dylan hard only finishing 3s back. Denzell rounded out the top 3. An even faster race for Dylan in leg 2 meant he secured the win. Denzell held off the charging Alan for the entire race to take 2nd by 0.2s. William improved the most and moved into 4th in Leg 2. Leg3 was a slower race but Dylan still took the win. However the race was for 2nd place between Denzell, Alan and Colin. Denzell was holding off Alan but then on Lap15 Alan made a super pass on the tight track to take second place. All 3 tightened up on the last two laps with Alan, unluckily, making an error on the last lap and allowing Denzell and Colin through to take 2nd and 3rd. 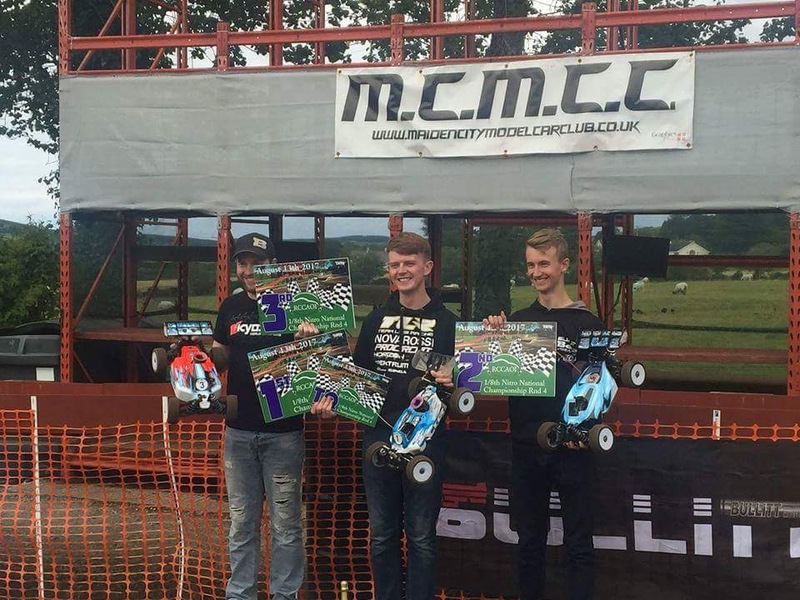 Final results were Dylan – 1st, Denzell 2nd, Alan 3rd. Ivan converted his pole position in Leg 1 and charged to the win. Gary had a breakdown late in the race but still managed to get second with Ken just pipping Chris by a few seconds. Gary broke down early in Leg 2 and Ivan cruised in for an easy win in Leg 2 to take the overall win. Chris and Ken had another great race with Chris taking 2nd place. Final results were Ivan – 1st, Gary – 2nd and Chris 3rd. Leg 1 saw everyone finishing according to grid order with Dylan taking the win by 4s from Denzell with Will in 3rd. Leg 2 was another very quick race with Dylan securing the overall win by beating Denzell by 5s. The final leg was much scrappier. A mistake on the first lap dropped Denzell from 2nd to 4th. Mistakes on Lap 2 and 3 allowed Denzell to get past Andrew and Will. Mistakes by Dylan allowed Denzell to get past later in the race to take the win with Dylan 2nd and Will in 3rd. Final results were Dylan – 1st, Denzell – 2nd and Will 3rd. Final results were Ivan – 1st, As usual the Naul produced some great racing with the track demanding concentration to make fast times and accuracy for passing manoeuvres. Finally, thank-you to all those who turned to up to race and also to Lee and the DMCC team for running a great event. The final Round of the Championship is at the DMCC on Sunday September 3rd. No championship is decided so there is everything to race for! Don’t miss it, see you there!! Round 2 of the RCCAOI 1/10 Off Road National Championships took place at NNN on June 18th. 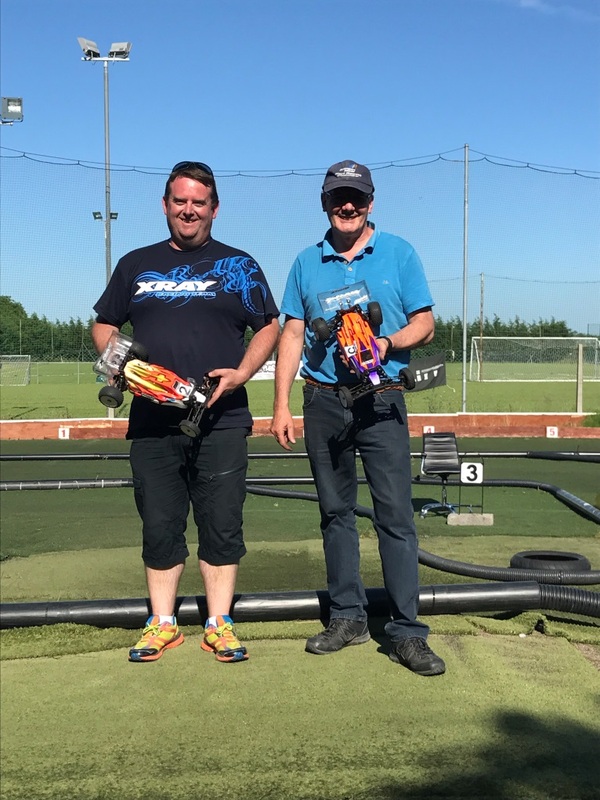 The sun was out and the team at Navan had prepared a great track so everyone was looking forward to a fun day at the track! The pace was close right from the first heat with 4 s separating the top 3 with Dylan, Derek and Denzell talking the top spots. Only William improved in Rd2 taking the fastest time with Dylan chasing hard but making some mistakes to drop back a bit from the lead. Rd 3 saw Derek take the win with a mistake free run and secured TQ for the day. Dylan snatched 2nd from Denzell by 0.05s to get second overall. Williams win in Rd2 saw him take 3rd on the grid. William won the first heat by just over 1s from Denzell. Dylan took 3rd and Andrew showing he was keen to do well was a very close 4th. With everyone making some mistakes in Rd 2, William ended up the quickest again, this time by only 0.05s from Derek. William really showed his speed in Rd 3 taking the only 12lap heat of the event. Derek made another 2nd with Dylan 3rd. Tony Dorney was fastest in the first heat with Graham chasing hard. Ivan, with a breakdown took 3rd. Ivan improved in Rd2 to 2nd but Tony took the win to seal TQ. Tony won again in Rd3 with Graham in 2nd. Alan made the best start in Leg1 and moved up two places. A mistake from Derek let Dylan into the lead and then a mistake from Will let Derek back to 2nd with Will dropping to 5th. A hectic last 3 laps some mistakes from Dylan and Derek allowing Will to recover to take the win from Derek and Dylan. A mistake on the first lap by Dylan let Derek, Will and Denzell into the lead to battle for the win. Eventually Will took the win by 0.6s from Derek and winning the overall at the same time. Dylan made it back up 4th. Another mistake from Dylan at the start of Leg 3 saw Denzell move into the lead with Andrew and Alan taking 2nd and 3rd from 6th and 7th on the grid. Just over halfway through the race and Alan moved into 2nd and Will was charging hard and was back in 3rd. All the action was on the last lap and after the dust settled, Alan emerged to take 1st place from Will and Denzell. Well done to Alan on winning a National A Final. Great racing from this young man!! Final results were Will – 1st, Derek – 2nd and Alan - 3rd. Leg 1 saw Tony show his speed with 1st place. Marcin took a great 2nd after a close race with Ivan. Leg 2 saw Ivan in another close race – this time with Tony. Ivan took the win by just over 1s with Gary finishing 3rd. Everything was wide open for the overall and the pressure was on Gary to convert the pole position. Ivan had the best and moved into the lead on lap 3 and wouldn’t look back. He won the race and took overall. After a very close race, Tony took 2nd from Graham and Marcin. Final results were Ivan – 1st, Tony – 2nd and Marcin 3rd. William continued his qualifying approach and won the first final from the start tone with no mistakes. Derek made an error on the 1st lap but recovered back to 2nd by lap 8. A mistake by Denzell on the final lap let Dylan into 3rd place. More of the same from Will in Leg 2: win from the start and securing the overall and a Double National Win – Well Done Will!! This time Derek made an error and couldn’t recover allowing Denzell to take 2nd from Dylan. Leg 3 saw Will make a mistake! But he would recover and still win the final showing his dominance on the day. A lot of racing and a few mistakes from the others resulted in Dylan taking 2nd from Denzell. Final results were Will – 1st, Denzell – 2nd and Dylan 3rd. Pole man Tony made an early mistake and Ivan took the lead on the first lap. Tony made it back into first for the win by only 4s from Ivan with Graham in 3rd. Leg 2 saw Tony lead from the start with Ivan moving into 2nd after a breakdown by Graham. Final results were Tony – 1st, Ivan – 2nd and Graham 3rd. Everyone had a great day in the sun and there was truly some great close racing on the challenging track. Finally, thank-you to all those who turned to up to race and also to Colin and NNN for running a great event.